Enjoy the benefits of a low impact workout while socializing with friends. 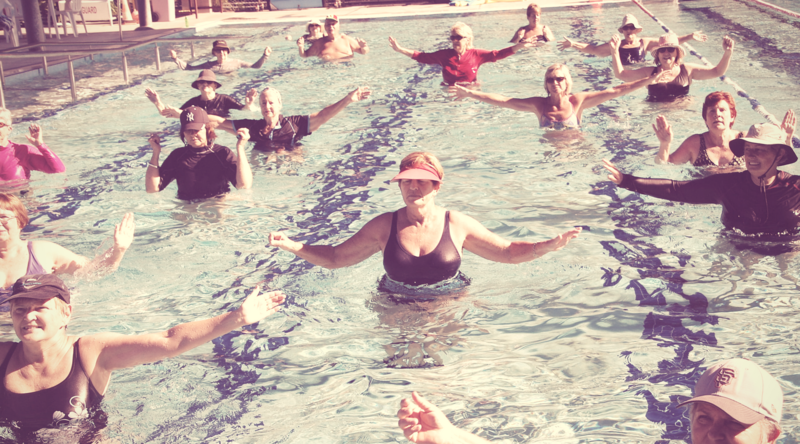 Using water resistance, you will enhance your flexibility, balance, and cardiovascular fitness. Aquacise is great for a total work-out, strengthening pre- and post-surgery, building flexibility, and managing arthritic conditions. This co-ed class makes exercising fun and is appropriate for non-swimmers. Aquacise is offered through a partnership between BVRA and Riverwoods. The classes are held at the Riverwoods pool located on Ridgecrest Circle in the Riverwoods Complex. The pool is a single depth of 4ft and is heated to approximately 85 degrees. Toletha Yoder: Toletha has been teaching with BVRA for over 3 years and can customize the level of strenuousness required to the participant. Toletha's upbeat nature and energy level bring a lot to every class. The fee below represents attendance at all classes. If you wish to attend fewer classes please call the office at 570-524-4774 and we can pro-rate the price for you.